Is the number of handicapped spaces proportional? I often find myself wondering what sorts of formulas are used by the people who lay out parking lots to decide how many spaces to dedicate to handicapped parking. However they do it, they often seem to be wildly off. For instance, look at these photos I took late last week, in the middle of a weekday, at the Target at Woodhill shopping center. You can see the two views more or less from the same vantage point. In the photo above, I’m looking slightly to my right, toward the store entrance. 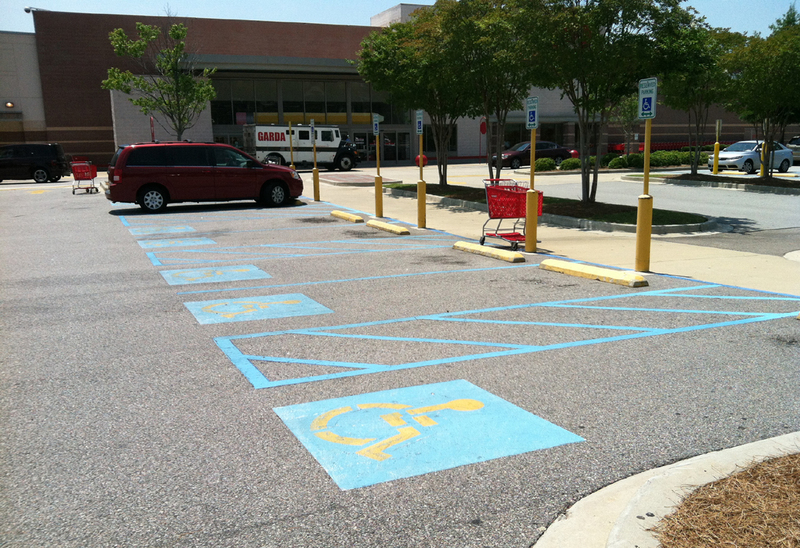 You see a huge expanse of spaces that are empty, because they are reserved for handicapped parking. Something seems off, although it probably isn’t. I say it probably isn’t because, if I backed away and took a picture of the whole parking lot, the number of “regular” spaces would be proportional to the handicapped — and if, say around Christmas, the whole lot were nearly full, so would be the handicapped spaces. But it seems to the casual observer, day to day, like the number of handicapped spaces are disproportional in relation to the demand. I worry a bit that the fact that it seems disproportional could undermine public support for handicapped spaces in general, since folks so often find themselves walking past so very many empty ones. Maybe there would be a way to shift the number of dedicated handicapped spaces according to the demand at different times, the way some cities change the direction of some lanes according to which way rush hour traffic is going. This entry was posted in Driveby on July 30, 2012 by Brad Warthen. This is a case where “intuitive” observation about something is both unnecessary and could be a detriment to making an informed decision. Just call up the appropriate folks at the DMV and find out how these decisions are made. My guess would be there has to be a certain percentage of handicapped spaces for every regular space. Does everything have to be so complicated? I’ll never understand intuitive thinkers. It just seems like a thinking process that can only lead to trouble if you dogmatically stick to a principal that is proven incorrect. That’s how we end up with silly stuff like marijuana laws. There is absolutely no rational, coherent, logical, sensible, practical reason marijuana is outlawed. This has only led to the massive incarceration rates that deprive so many of their liberties simply for a bit of harmless pleasure. Yet the intuitive thinkers will argue that in a community we must uphold standards because it is obviously the right thing to do. Bah! Use reason, not voodoo to make public policy. They are proportional to the size of the entire lot. However, the rationale for the ratio is just mumbo jumbo unvetted opinionating. In fact, it is probably most accurately described as the ratio at which disability advocates (and their attornies) stop suing retailers and developers. So as you walk by just think of most of them as graft or extorsion avoidance. I fully appreciate the need for such spaces, and the importance of designing their access and movement to benefit the disabled. But the ratio is just a joke. The real downside is that it encourages the handing out of handicap tags to a wider assortment of folks on the basis of, well gee, the spaces are sitting unused so what’s the harm in authorizing this person to obtain the handicap tags? I think they need to put them at the rear of the parking lot. Most of the people I see using them aren’t “handicapped” other than just being fat. If they walked further, they might be able to turn in their fat pass tag. I’m always a little uncomfortable questioning ANYTHING set aside for anyone less fortunate than me, whether it be social welfare, parking spaces, or even the larger handicapped toilet stalls. While I will have to limp the 30-40 spaces to the store entrance (arthritis in my knees), I will be thankful I don’t have to reach behind the seat and pull out a walker or wheelchair, especially if I couldn’t find a special wide-egress handicapped spot. (5) (a) If parking spaces are provided for self-parking by employees or visitors, or both, then accessible spaces complying with 4.6 shall be provided in each such parking area in conformance with the table below. It does seem odd that a store like Lowe’s, that doesn’t seem to have those motorized carts like Walmart does, would have so many spaces. Like, if you park a few yards closer, is that going to help you once you get inside. I also get a bit annoyed when I’m with my parents, who don’t move so quickly any more but who are not going to apply for a tag, have to limp by so many empty spaces. @Kathryn – What’s to keep you from dropping them off at the door and then parking? A lot of people who don’t appear to be handicaps have some that are not immediately visible to others. For example, a person might have severe COPD, which would mean that they couldn’t walk far, especially on a smoggy, high ozone day. I will admit to being a bit irritated though when I watched a man carry out 2 cases of beer and load them in his car without any apparent strain, then drive away. Oh well, perhaps he was one of the morally handicapped. 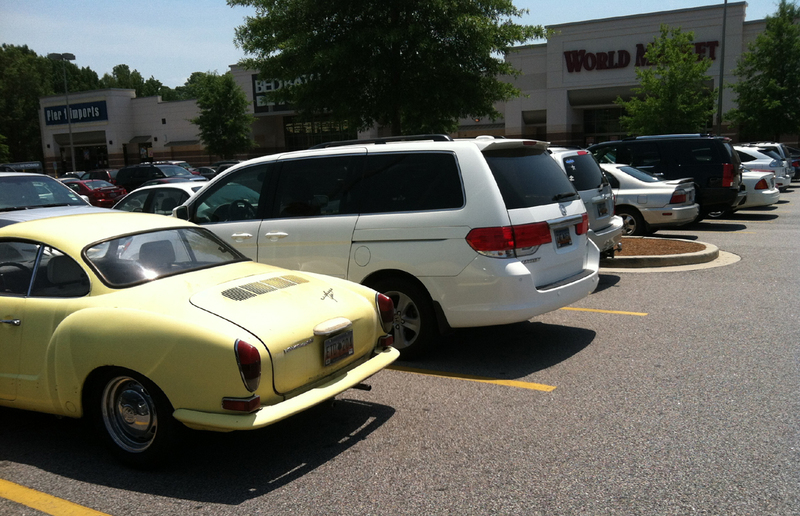 One of them is driving…. This post says a lot about Americans: They are just plain lazy. Seriously folks during the holiday season there may not be enough handicapped spaces. And that will be when they are needed most. Stop whining about having to walk a couple more feet to get to the Target. No wonder we are so fat as a nation. It would be great if we could tag the morally handicapped… might need to up those parking ratios though. The morally handicapped do a pretty good job of ‘tagging’ themselves.